Because Blogger problems interrupted Thursday's terrific post by Ellen Byerrum, I've reposted it today. JAN: I met Ellen Byerrum at the wonderful Festival of Mystery (MysteryLovers Bookshop) in Oakmont, PA, where I think the seating was alphabetical. On another "road trip" we had dinner in the LAX airport. (at least I think that was the airport.) She is as a former Washington, D.C., news reporter, and a playwright, and she also holds a Virginia private investigator's registration. Her Crime of Fashion mysteries star Lacey Smithsonian, is a reluctant fashion reporter in Washington D.C., "The City Fashion Forgot." 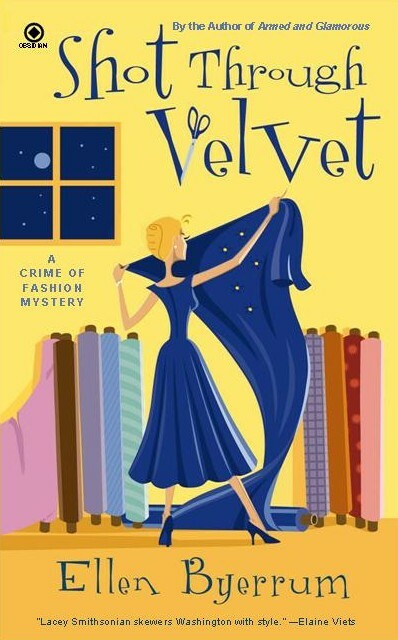 The latest in the series, Shot Through Velvet, won a starred review by Publisher's Weekly. Today, Ellen has agreed to talk a little about road trips -- and the one that brought her inspiration in her new book. With the price of gasoline soaring out of sight, I fear that the Great American Road Trip may be endangered. It makes me nostalgic, even as I hit the highway to Pittsburgh for a mystery gig. I have no guilt, but I wonder how many more road trips lie ahead, or are even possible in the future. But the summer is close at hand and the road calls to me. Now, a road trip is not the hateful daily commute on streets designed by a committee of deranged monkeys. A road trip must be taken beyond the Beltway, out of the city, far from the overwhelming traffic. And I-95, the Devil’s Highway, doesn’t even count in this equation. The desire for a road trip can strike at any time, most often when you’re working. On deadline. You just want to jump out of your office and into a car and drive. I remember clearly that itchy feeling grabbing me one day when I was working as a reporter, covering hearings in Washington, D.C., at the Labor Department on an OSHA ergonomics regulation. I was risking a hind-end sprain from sitting on their non-ergonomic chairs and a mind sprain from listening to business attorneys who were turning intellectual cartwheels trying to prove there were no such things as work-related musculoskeletal disorders. At lunchtime, I escaped a few blocks away to the National Building Museum, where there was a mesmerizing exhibit on the American Road Trip. The exhibit began with an old commercial (from the era when Dinah Shore roamed the earth) exhorting you to “see the USA in a Chevrolet.” There were maps and photos and the full-size interior of a funky old motel room. My mind was pumping the words, Road Trip, Road Trip, Road Trip. Needless to say, I was fantasizing about hotwiring the nearest car and hitting the highway, getting as far away as I could get from the OSHA hearings. Sadly, my skill set does not extend to hotwiring cars. I returned to the hearing with only one thing on my mind, and it wasn’t ergonomics. I dreamed of escape! In a car! The open road, my foot on the accelerator, my troubles squashed flat beneath the wheels, and the wind in my hair. When the opportunity for travel comes, I don’t take it for granted. I seize the moment, and the wheel. The miles go by with the radio on. I sing along to the music; my husband doesn’t mind. The miles go by, and my thoughts are quiet, story ideas rumbling around in the back of my mind, complete with plots, characters, action and new settings, perhaps near the hot springs I just passed. The miles go by and I wonder what people do in these small towns. Who lives in that house? What do they do out here? What about that abandoned house? Where does that side road go? The miles go by, and with each green mile I feel a deeper satisfaction, a deeper sense of quiet, a deeper exhale. The miles go by. If you see me on the road, be sure to wave. To learn more about Ellen or check out her books, go to her Website at http://www.ellenbyerrum.com. Congratuations on your newest book. It sounds terrific. I'll look for it. I share your road trip fever and especially your interest in the byways, not just the highways. People who stick to the fast but tedious interstates miss the diners, used bookstores, antique shops, local museums and farmstands. Not to mention the bakeries. And the sunsets. Now I'll be daydreaming about a road trip all day . . . Thanks, Brenda. Road trip fever gets in your bones, I think. Now that you mention it, I'm dreaming about the fresh produce at a farm stand. It really is the small moments of a trip that linger. I used to live in a town that in the 19th century was home to the water-powered Victoria Plush Mills, which must have made upholstery fabric. The tall smokestack bearing the name is still there, although the mill is long gone. There's so much beautiful country out there! The trick is to drive with someone who is willing to stop on the spur of the moment to investigate the odd antique store or bakery, rather than being focused on "getting there," wherever there is. I ADORE road trips. That's why I sometimes drive to mystery events instead of just flying from one place to another. How else would I ever know about the Bob's Big Boy in Tipp City, OH or the cool truck stop somewhere in MD (or was it WV) where my husband and I thought they were going to kill us but we all wound up sharing peach pie recipes? AND, I love Ellen. Apart from being a terrific writer she has an amazing sense of style. I'm such a fangirl, I'm constantly asking her.."Is that vintage?" Do I sense a road trip coming on?? This is fabulous, because I get a road trip this weekend. (North in California, through the central valley and up into the foothills of the Sierras.) Now you've inspired me to get off the "do this, do that, get there" and spend some time with my imagination along the way. Thank you! And I loved the new book. Congratulations! Sheila, you are so right about having a companion who's willing to stop and explore the byways. Luckily, my husband is always game. For years, we traveled with a book called "Weird America" so we could check out towns with strange happenings. Lots of fun. And I love the sound of Victoria Plush Mills. There are very few mills left. When I explored the Virginia velvet factory, there was only one velvet factory left in this country. It's very sad to see what has become of a thriving textile industry. Rosemary, I think you would be fun to travel with and I'm sure we could get in some interesting trouble. I had no idea about the Big Boy, but Ohio is one of those places I really don't know even about. Also I have to say, I try to check out those lovely vintage shops. I just scored a fabulous 40s suit at "Hey Betty" in Pittsburgh. Tammy, I hope you'll write a report on your upcoming road trip in California. Again, I haven't seen enough out enough of that beautiful state, though I have seen a couple of the early missions. Oh, Ellen, what a lovely way to start the day! Thank you! And I know the truth--that you are really just seeking out gorgeous vintage fashion--I've never seen anyone with such a closet! And such a sense of style..,have you always been interested in vintage? Hi, Hank. I thought you had an incredible closet. You are always beautifully turned out and make the rest of us pale in comparison. And the shoes you wore at Malice! Beautiful. But vintage clothing? The first piece I had was an old green corduroy coat that was my mother's. I wore it till it was threadbare and she had to hide it from me. Basically, I love vintage clothing, mostly from the 1940s, because it's so much better made and it fits me. And I also think that some of the spirit of the woman who had it before might linger. But maybe that sounds a little crazy. I love traveling, WALKING around when I get there, and most of all eating the usually unhealthiest local thing... like Cincinnati's Skyline Chili - no-bean chili made with ground beef, cinnamon, cloves and unsweetened chocolate, serve over limp spaghetti noodles and mounded over with hairy cheddar cheese--there's a reason it never went national). Or French dip sandwich in Sacramento. Philly cheese steak in...Philly. Red hots in Chicago. And isn't there something like a corn dog only in Dallas? In California I just go to the supermarket and buy oranges and tomatoes. Driving: not so much. Except somewhere like Arizona where it seems like every time you crest a hill the landscape undergoes a transformation. One day I want to do a road trip with Ro. I think I would not get bored. I agree that walking around is great, Hallie. especially after several hours on your bottom in the car. It really is the only way to feel a place. And food? I'm still trying to work off the sweets I consumed at the Oakmont Bakery, which is absolutely delicious and diet-defying. And as a Westerner, I dive into the Mexican food back home. I want to know why the only place I can find crispy Chile rellenos is back there. But cinnamon in my chile? Not so much. But maybe I should try it again. I'll think about it while I'm at the dentist this afternoon. Ellen, your books sound delightful. And I LOVE road trips. I hope this isn't a generational thing that's dying out. I traveled all over the country with my parents when I was a kid. Remember vienna sausage picnics? Rest stops? Those wonderful tee pee motels? I got the idea for my first novel from something I saw on a road trip in England. I think there is something that inspires that dreamy, imaginative quality, the feeling that anything can happen . . .
Road trips might be different today, Deb, what with TVs in cars for kids. I don't know, but I think that might be as annoying as fighting withyour brothers and sisters. I never actually saw a teepee motel, though I would have loved it. I remember driving through corn fields and sunflowers. You're so right about that dreamy, imaginative feeling. Hey Ellen I tried and tried to post on thursday but Blogger ate everything! Loved your post--I have such fond memories of road trips, beginning with Deborah Donnelly and Libby Hellmann in 2003. We knocked off California! Hey, Roberta. Thanks for stopping by today. I think the Thursday glitch was an advance Friday the 13th surprise. As for the great American road trip, I'm glad that people can relate. I remember driving to California with a friend, on a shoestring and a prayer and the optimism of youth. But what a great memory. How weird that everything just disappeared. I tried to post when blogger went belly-up, very weird! Ellen, I'm a fan of the Lacey books and can't wait to read your latest. It's very interesting to read what you've learned about velvet...love that fabric! Nice to see you here at JR.